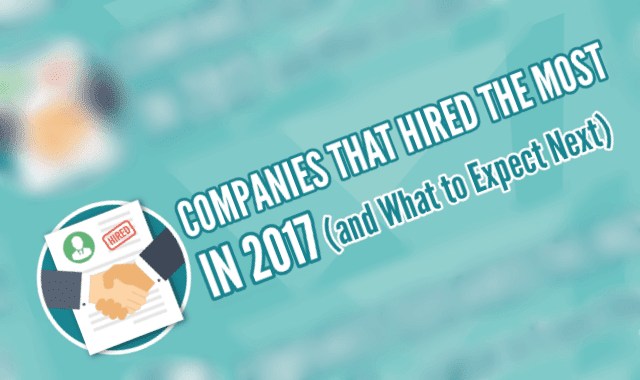 Companies That Hired the Most People in 2017 #Infographic ~ Visualistan '+g+"
The job market is a hot topic these days. Who’s hiring? Who’s laying employees off? What industries will continue to grow and need to hire in the future? This infographic takes a detailed look at the companies and industries that having been growing their work force over the past year, and which areas will be seeking new employees over the course of the next decade. Health care is one industry that has been building their work force and will continue to with many new advances in medicine on the horizon. The military has also seen an increase in hiring, which is understandable for an increasingly volatile world. But where will we see the most job growth in the future? The greener initiatives, such as solar and wind, take that prize. They both are predicted to double their current number of employees by the year 2026. Which industries do you hope to see growth from in the future? This infographic from TitleMax.com has all the answers!